Dorothy's husband telling Dorothy that he needs to find somewhere to stay, and asking her not to say anything about his past. Harold teasing Joe by pretending to get a bowling ball stuck on his hand! Doug is dressed in a suit, practicing what he's going to say to the bank manager. 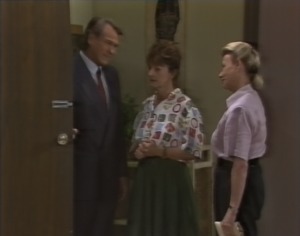 Pam pretends to be the bank manager, and she comments curtly that Doug is overdue with his house payments. DOUG: Yes, well, a client of mine has delayed a substantial payment, which has resulted in a temporary cashflow problem. DOUG: But the money will be coming in eventually. Pam sighs at Doug that ‘eventually' could mean a long way down the track. Continuing the customer/bank manager charade, Pam says she supposes they can agree to what Doug's suggesting, as long as the payments are made promptly next month. DOUG: Thank you, Mr. Kennard! Me, my wife and my starving children thank you! In the kitchen, Helen asks Glen if he's working at the Waterhole today. Glen replies that he's doing the evening shift. Lucy comes in and Helen tells her that she's going to be late for school. Glen looks at her and comments that she's wearing his shirt. LUCY: Do you *mind* me wearing it? Helen tells her that they'll have to do something about getting her a uniform. Lucy retorts that she'd rather keep wearing casual clothes. Helen, however, tells her that Dorothy will soon start making a fuss. Jim joins them and suggests that Helen asks Madge if Lucy can have some of Gemma's uniforms. Helen nods that that's a good idea – and it might be a good opportunity to test the water. JIM: Are you afraid she might not talk to you unless you come up with the dirt on Dorothy's husband?! LUCY (to Glen): Going out again tonight? LUCY: Oh. I guess I'll just have to amuse myself. With that, Lucy walks out, looking annoyed. Gemma is making pancakes as Helen stands with her and asks if Madge didn't seem angry. Gemma replies that she seemed fine this morning. She then adds that it's fine for Lucy to borrow her uniforms - *she* won't need them anymore, thank God! The two of them sit down at the table and Helen remarks that it's good to see Gemma looking so fit and well again. She asks how everything else is. GEMMA: I still think about Matt a lot, but I guess it wasn't meant to be. HELEN: You'll soon find someone else. GEMMA: I might not get the chance! Aunty Madge is already on the case: I think she's trying to match me up with Adam Willis. Can you believe it?! What a joke! HELEN (uncertainly): Why is it such a joke? GEMMA: Despite what Aunty Madge says, I think he's still involved with Caroline, isn't he? HELEN: No... I think your Aunty Madge could be right. From what I can gather, it's more or less over. Does that make a difference? GEMMA: No! No, he's not my type. GLEN: I think it might be best if I moved out. JIM (looking astonished): What brought this on? I thought you were *happy* here. GLEN: Well, things just aren't going as well as you think. He tells Jim that the house wasn't as full when he moved in – and it's also to do with Lucy. Jim tells him that he'll drag her back into line. Glen insists that he doesn't want Jim to give Lucy a hard time. Jim assures him that it isn't a problem. Pam finishes re-dressing Helen's ankle. 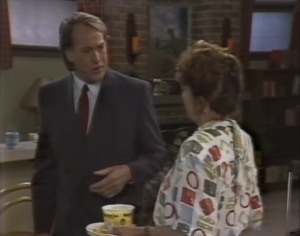 As the two of them head to the front door for Helen to head off, Doug comes in, wearing his suit. Helen smiles that he looks handsome: he obviously has a big contract in the offing! DOUG (glancing at Pam): A funeral. HELEN (sincerely): I'm so sorry. DOUG: You weren't to know. DOUG: It's nice to know I can do *something* right. Lucy sits down at a table. Gemma is clearing another table nearby and Lucy calls over to ask for an orange juice. GEMMA: You're Lucy Robinson, aren't you? LUCY: Yeah. How did you know? LUCY: Second cousins twice removed. GEMMA: Or third cousins in law. I don't know! Gemma then apologises for not having introduced herself until now; and she adds that she was going to pop round later and bring Lucy some of her old school uniforms – and some of Charlene's too, so Lucy can pick and choose. LUCY: I don't want any old, cruddy school uniforms. GEMMA: They're in perfect condition, if that's what you're worried about. LUCY: I don't care *what* condition they're in; I just don't want them. GEMMA (rolling her eyes): I was only trying to do you a favour. I'll know better next time. 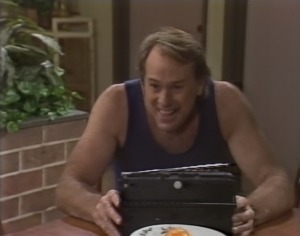 Doug is loading up his ute. Pam joins him and tells him that she'll see him at dinnertime. She heads off to the hospital. Glen comes along and tells Doug that he has a message for him from Brett from the Waterhole: he's got a hot tip on the gee-gees: he reckons it's a 20-1 sure thing. GLEN: Yeah. Sounds so good I'm going to put a tenner on myself. Doug stares at him and then takes his wallet out of his pocket. He hands Glen some money, saying he has a gut feeling about this. GLEN (looking astonished): $150? Are you sure? DOUG: Yeah – for a win. GLEN: Wouldn't you be wiser to back it for a place? DOUG: On the nose. This horse sounds like a winner to me. GLEN (shrugs): Oh well, it's your money. Race starts at quarter to five this arvo. Jim is working at the kitchen table. Helen hobbles in and asks if that was Laura Cardew on the ‘phone. Jim tells her that she had some bad news: Wally died - from a heart attack. Helen replies that she's so sorry: she knows how close Jim was to him in Vietnam. Jim tells her that, on top of everything else, Wally didn't leave a will, which means his estate's in a real mess. HELEN: I suppose a lot of people don't think about making a will until they're much older. JIM: I thought all *my* affairs were in order, but of course, I haven't made any allowance at all for Glen. HELEN: Are you going to? JIM: He's entitled to *something*. Jim goes on that he doesn't like the idea of reducing the other kids' share... but Paul's never going to need the money, so he suggests to Helen that he give Glen Paul's share. He adds that he'll be leaving Paul plenty of personal effects. HELEN: It sounds fair enough – and as you say, Paul will never want for anything and Glen doesn't have a penny. JIM: That's settled, then. I think I might tell Glen; it might just be the thing to help him feel like part of the family. Gemma is sitting at the kitchen table, in front of a typewriter, trying to work out what to write on a job application. There's a knock on the door and she answers it to find Lucy standing there. GEMMA (curtly): Oh, hello. You've come for the uniforms, have you? LUCY: I want to apologise for the way I acted in the Coffee Shop. I can be a bit tactless at times. LUCY (smiling): You're not making this easy for me, Ramsay! Can I come in? Gemma lets her in. She then asks Lucy if she always gets so aggro. They go and sit down at the kitchen table and Lucy explains that everyone's been giving her a hard time about wearing uniform and she just took her frustrations out on Gemma. She adds that Dot the Dragon had a go at her this afternoon, so she *will* take those uniforms. LUCY: But I am still wearing earrings! GEMMA: You've got to rebel somehow, don't you?! Gemma offers Lucy a drink. Lucy accepts, adding that she hopes she's not interrupting Gemma's work. Gemma explains that it's just a job application. She tells Lucy to take a look. Lucy does so, telling Gemma that she learnt how to do job applications at her old Business Studies class. GEMMA: How does it measure up? LUCY: It's lousy. You've really got to sell yourself and you've got to be super-confident. GEMMA: Yeah, but I don't want to come across as being big-headed. LUCY: You'll never get a job with that attitude. This will just have to go. With that, she rips the sheet of paper out of the typewriter and feeds a new sheet in in its place. JIM: I'm really pleased that you decided to give this place a chance. I know there's no way that I can make up for the twenty years that I wasn't around, but I hope one of these days that you'll get to feel like part of this family. I already feel responsible for you, whether you like it or not – and to show you that I think of you as part of this family, I've changed my will so that you're looked after like everybody else. Mind you, there won't be a lot of money, so I wouldn't get my hopes up too high. GLEN (sounding surprised): I really don't expect it... and I'm not your responsibility at all. JIM: I know how independent you've always been – but you're as entitled to this as any of the other kids, so why knock it back? GLEN: I don't want any special treatment. You've done more than enough already – and I can look after myself. JIM: You're *not* getting special treatment; it's the same as the other kids. GLEN: Yeah, but they deserve it. I don't. I'm a ring-in. JIM: *I* don't look at it that way. Please, Glen, accept. 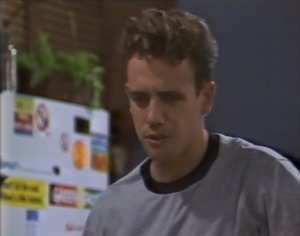 GLEN (curtly): Look, I don't want your money. Thanks for the offer, Jim, but no thanks. With that, Glen marches off. GLEN: Yeah, well I thought he might want to chicken out and make it each-way. I mean, it's a lot of money even if it *is* a sure thing. PAM (looking thoughtful): It's lucky you thought to ask, actually, Glen. Um... he rang – minutes ago - and he, er, well he admitted that he *was* having second thoughts about the bet. GLEN: Make it each-way, then? PAM: No... he, er, well he thought he'd cancel it completely. GLEN: That's a relief, actually! Would've felt terrible if he'd lost! With that he takes the $150 out of his wallet and hands it back to Pam, who grabs it quickly. He walks off, leaving Pam looking thoughtful. Gemma is just finishing using a can of hairspray to style Lucy's hair. Lucy smiles that it's great: she wishes she could go out on the town and show it off tonight. GEMMA: Well if you do, just make sure you don't mess it up while coming in through the bedroom window! GEMMA (grins): I saw you last night: very elegant, I don't think! Lucy, looking concerned, asks Gemma if she's told anyone. Gemma assures her that she hasn't: she's done her fair share of bedroom entrances herself! Lucy tells her that Glen is annoyed with her because he took her out and wasn't too thrilled that she kicked on with one of his mates. Gemma asks if Glen has a girlfriend. LUCY: He's not interested in going with anyone. GEMMA: They all say that until the right girl comes along! LUCY: Not in *his* case. GEMMA: Let me know when he starts looking, will you? GEMMA: I wouldn't mind getting to know him a bit better: he's pretty gorgeous! With that, Lucy says she'd better head off. Helen asks Jim how his talk with Glen went. Lucy bursts in suddenly, carrying a pile of uniforms. Helen smiles that she loves Lucy's hair! Lucy explains that Gemma did it for her; she thinks they'll be really good friends. Helen asks if the uniforms need adjusting. LUCY: I think they should be OK. I'll go and try them on now. I just know this new look will go down well with my new hairdo! Lucy heads off to her room, leaving Jim to comment that if they're Gemma's uniforms, surely they must be a little short on Lucy. HELEN (a twinkle in her eye): Something tells me that Lucy might like them that way! Helen then asks about Glen. Jim explains that he knocked him back; said he felt like a ring-in. He adds that he thought he might let the matter rest for a while and bring it up further down the track. HELEN: If you've decided to put Glen in your will, you do just that. It's not as if you need his permission. HELEN: And when the time comes – hopefully in the *very* distant future! – he'll be glad of an inheritance. JIM (looking thoughtful): Yeah, you're right. I wouldn't want Glen to miss out should something happen to me. I'll go and see my solicitor first thing in the morning. Doug is sitting at the table, listening to the racing on the radio, when the front door opens and Pam comes in. A sheepish look crosses his face. DOUG: Don't get upset, Pam, but I put a little wager on the horses. DOUG (ignoring what Pam said): I know I said I wouldn't gamble again, but I got this great tip – and guess what the horse's name is: ‘In the Black'. Is that a great omen or not? PAM (coolly): And how's our little omen *going*? DOUG: Great, great! She's up the front somewhere. DOUG: Do you know what this means? We'll be able to pay the bank what we owe and tell Kennard where to go! Sweetie-pie, what do you think of your old man now? !